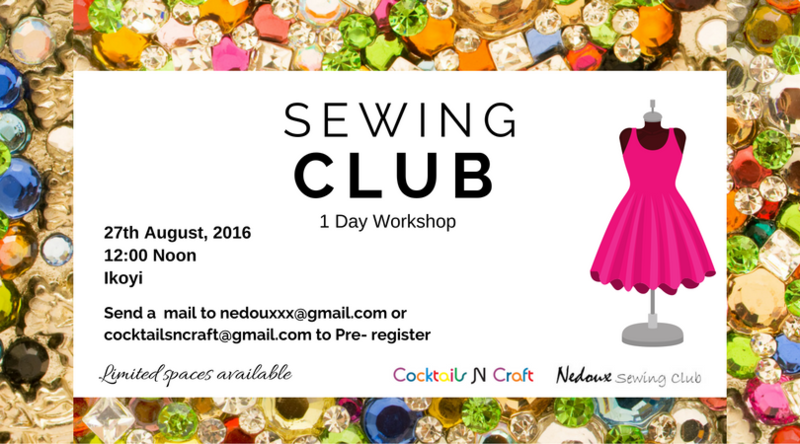 The Nedoux Sewing Club and Cocktails 'n' Craft Nigeria are holding a one-day workshop on Saturday 27 August 2016, designed for people who are interested in learning DIY sewing skills in a social atmosphere. It's suitable for absolute beginners. The instructor for the day is 'Nedu Ahanonu; an avid sewista who is passionate about making the sewing process appear both easy and doable. She strongly believes in the DIY ethic because it promotes the mindset of self-sufficiency and an entrepreneurial spirit. 'Nedu also writes a a witty blog about her musings and sewing projects at www.nedoux.com. Come and learn about the dressmaking process and sew a pretty garment. Limited seats are available, for enquiries about the fee and venue, please send an email to nedouxsews@gmail.com & cocktailsncraft@gmail.com . Well done Nedu for doing this! The first one seemed like such a success and you're having another so quickly! I know, right? Well done to her!